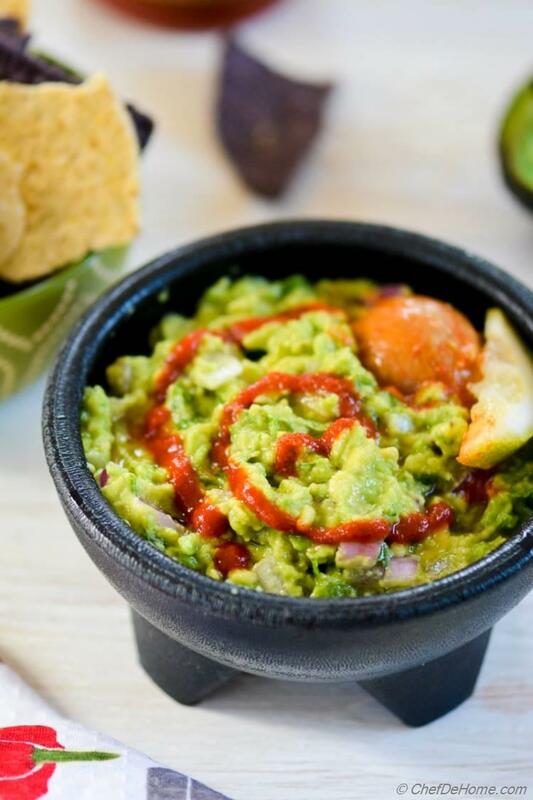 A real treat for Guacamole and Sriracha Lovers! Here we are again, for my love of Mexican Cuisine, avocados, and our very own "Holly Guacamole"! Today, one more delicious ingredient has joined my fiesta Mexican party and i.e. SRIRACHA! One of "the best" Asian condiment on earth that can add flavor to anything from Mexican Quesadilla, Potato Fries to Grilled Burgers! And I'm not paid to say this, I just happen to love sriracha. Mexican food is already pretty zesty and flavorful with a wide variety of chiles used in this cuisine..... then, why Sriracha!? Well, I would say.... in my home... sriracha makes it's way to anything and everything I love. That's why! 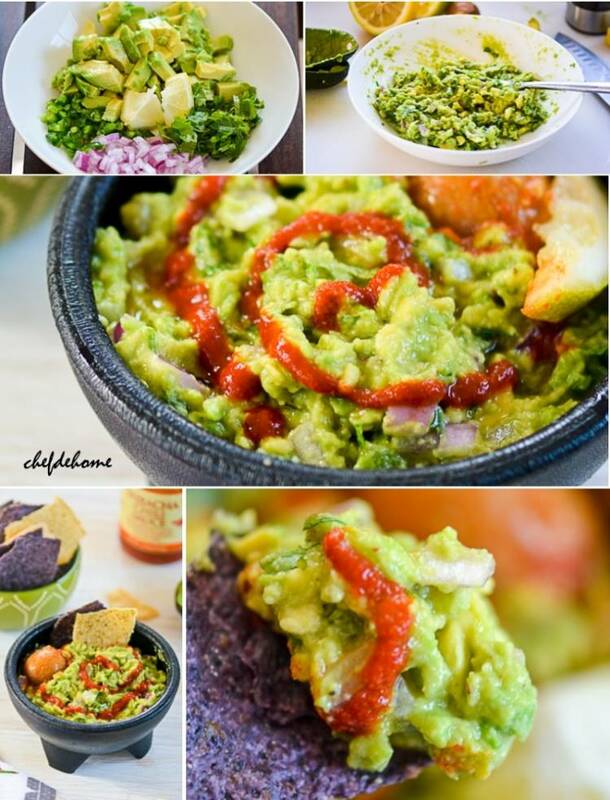 :) and there is always room for "one more guacamole"..... so, why not Sriracha Guacamole?! Caution! 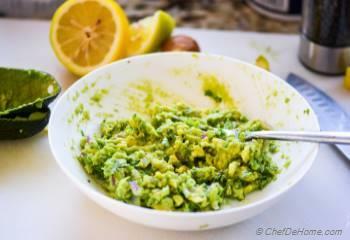 If you trying this recipe, I warn you, make a big bowl, because this guacamole has qualities to vanish from Dip Bowl! Just take care of one thing, never mix/mash sriracha with avocado. Just swirl or drizzle on top. 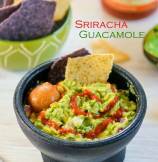 2) I figured, sriracha taste was more pronounced and complimenting the tangy-creamy guacamole, when I just drizzled it on top. A good way to get delicious taste of sriracha in every bite! So, unless you want to hide sriracha, don't mash two together. Plus it looks beautiful drizzled on top! Doesn't it? 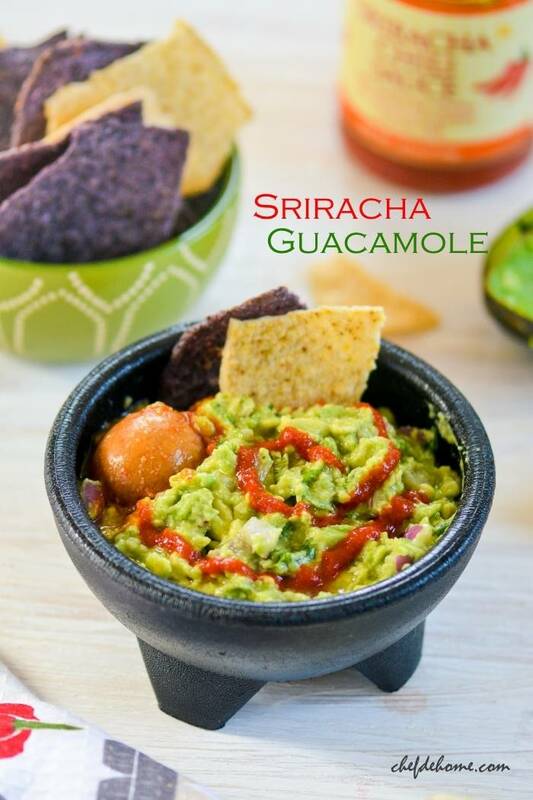 Just in-time for Cinco De Mayo, I have given you one more reason to serve guacamole to your guests with delicious addition of sriracha! I'm sure your guest gonna love the taste! 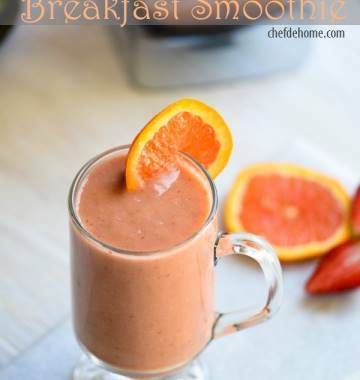 So bookmark this recipe today! Serve it with big bowl of tortillas chips and enjoy! Total Time 10 minutes Prep Time 10 minutes Cook Time 0 minute Difficulty Easy Yields 2 Cups Serves 4 Notes No. of servings depends on serving size! Smart Swap Did you know, guacamole can also be used for as healthy spread on sandwiches? 1. 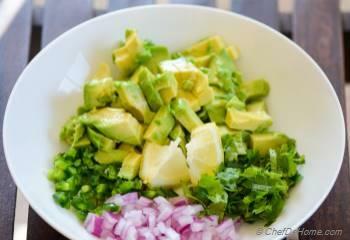 In a large bowl, fine chopped red onion, minced jalapeno, cilantro, diced avocado, and lemon juice. 2. Using back of a large fork mash the avocado to a coarse consistency. I like to keep it little chunky! Or you can add all these ingredients in a food processor and pulse until avocados are mashed to your liking. Season with salt, black pepper, taste and adjust lemon juice if needed. 3. While adding guacamole into the serving bowl, drizzle sriracha sauce in layers. Or add a good swirl of sriracha on the top. Garnish with some lemon wedges ad cilantro. 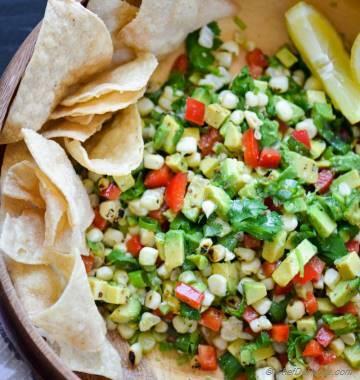 Serve with a bowl of tortilla chips! Enjoy! 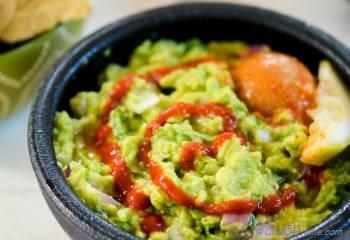 Never mix sriracha in guacamole as that create a dull a green color which does not look appealing to eye. Adding a swirl of sriracha will make it look mouth watering. Also sriracha taste stands out and compliment the guacamole. thanks, Darlene! Glad you like it! Mira, thanks dear :) I'm glad you like it! and thanks a ton for pin! You rock! I put sriracha on almost everything. Why have I not thought to put it in guac?? Girl, I just LOVE avocados in any form. 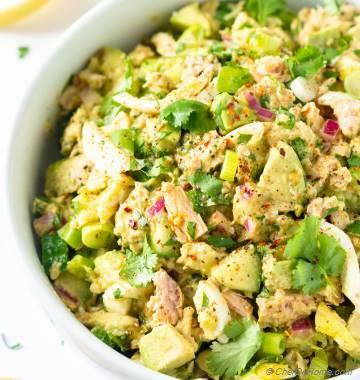 Guacamole is a total favorite and yours looks amazing. Please pass the chips! I'm definitely intrigued! Can you believe I haven't had sriracha yet? It's all over NYC and I managed to not try it. This needs to change now! Really?! then do try it, Olivia, I'm sure you will love sriracha! Actually, you know, I also tried it at an odd place. Not in any chinese or korean eatery, but in a local pasta shop :) Loved it since then! Guacamole is looking tempting, absolutely yumm. I love the pictures you captured, they are mouthwatering !! It looks delicious and mouthwatering!!! Anu, thanks a lot! I'm glad you like it! Also, many thanks for pin my friend!